McDowell is still in contention in California. GRAEME MCDOWELL IS still in contention at the AT&T Pebble Beach Pro-Am after a second round 70 left him five shots off the lead, however there was less luck for Shane Lowry with a 77 leaving him four over. 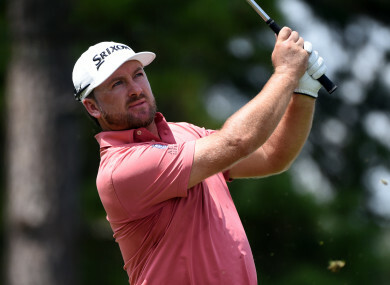 McDowell, who won the 2010 US Open at Pebble Beach, was delighted to be competing at the Northern California course this week after a left wrist injury slowed his start to the year. The 39-year-old added a one-under par 70 at the Monterey Peninsula course to Thursday’s four-under 68 at Pebble Beach to be just outside the leading 20. Phil Mickelson and Jordan Spieth were among five players tied for the lead when the second round was suspended due to inclement weather. It was crowded at the top of the leaderboard before the rain hit on Friday, with Mickelson, Lucas Glover, Scott Langley, Paul Casey and Spieth all 10 under. Mickelson signed off on a four-under-par 68, while Glover (66), Langley (69) and Casey (64) were able to complete their second rounds, however Spieth was through 16 when officials halted proceedings. Former world number one Spieth was five under after 16 holes at the time as the American star – without a PGA Tour victory since 2017 – prepares to complete his second round on Saturday. Four-time Pebble Beach champion Mickelson, who hit all 13 fairways for the first time since 1998 on Thursday, was one shot off the pace at the end of the opening round. But the five-time major champion recovered from three consecutive bogeys to birdie the last and earn a share of the lead. Australian Jason Day is a shot behind after completing 15 holes of his second round, while Scott Piercy (through 15) ended the day at eight under. Meanwhile, defending champion Ted Potter Jr was languishing in 153rd position at 12 under overall through 17 holes. Email “McDowell in contention at Pebble Beach, while Mickelson and Spieth in five-way tie for lead”. Feedback on “McDowell in contention at Pebble Beach, while Mickelson and Spieth in five-way tie for lead”.